Our Emergency Medical Technicians are trained by Lifeskills Medical – one of the foremost providers of emergency training for public and commercial services in the UK and overseas. Most of our members are First Responders, trained to the FPOS Intermediate level accredited by IHCD – the Institute of Health Care and Development. We are therefore very well placed for working closely with NHS ambulance crews. Every member is also subject to an Enhanced Disclosure check through Disclosure Scotland. Our ambulance is purpose-designed for providing on-site services at a wide range of events. An automated ramp and air suspension provide easy access. External lights illuminate the scene of an accident at night. Internally, the facilities include one trolley stretcher, two passenger seats, running water and examination lights. All windows can be screened to ensure patient privacy. Our equipment enables us to deliver oxygen, defibrillation, pain relief and fracture immobilisation. Our diagnostic aids include BP monitors and pulse oximeter. Naturally, we also carry a wide range of dressings, bandages, blankets and other materials for patient comfort. As a radio control point, our ambulance regularly manages a network of 10 handsets, so that the first aiders at a dispersed event can keep in contact. The range of equipment and skills that we can offer means that we are an integral part of Fife Council’s Emergency Planning strategy. In that capacity, we work with other voluntary and statutory organisations who may be called upon to respond to a large-scale or prolonged emergency. We are particularly experienced at off-road events. Recent examples include motocross, quad racing, point to point horse racing, hunter trials, highland games and athletics. 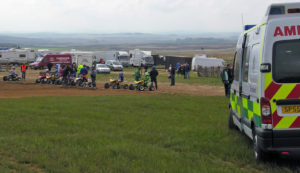 We also provide spectator cover at motor racing, fairgrounds and agricultural shows. Naturally, we are also able to help with smaller events varying from local theatre shows to church fetes. Whatever the scale of your event, we would be happy to quote costs for an appropriate level of cover.